The more we deny, the farther we are moving away from happiness. Denial is the first sign of your mind taking over your Life. Denial thrives because the intellect thrives. And whenever the intellect is at work, you can be sure that the mind is controlling you and not the other way round. Life’s problems don’t happen all of a sudden. They always build up over a period of time. We don’t see the problem as it is because of the state of denial we are often in. A smoker knows smoking will lead to cancer. But he or she keeps denying this reality will affect his or her Life. And so goes on smoking. Many, many months before my Firm went bankrupt, a wise client (and a close friend) of mine had told me that “if you continue running your business this way, pretty soon you will go bankrupt”. I denied his sage counsel. I thought since he belonged to a generation ahead of me, he was conservative and hence not a risk-taker. So, I did not heed his advice. Eventually, when my Firm’s fortunes came crashing, I awakened to the realization that I should have never denied the problem we were in all that while. 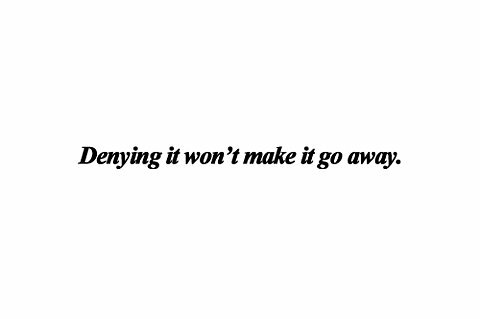 Denying something even though you know it exists__a financial, relationship, health or self-belief problem__doesn’t make the problem go away. Or simply, denial does not help you avoid experiencing pain in a problem situation. It, in fact, increases your suffering. Because, since the problem doesn’t cease to exist, and continues to nag you, you are forever consumed by your fears. Wherever there is fear, suffering will be there too. To be sure, on the other hand, accepting__and not denying__a problem too does not make the problem go away. But because you accept it, and therefore you attempt to work on solutions__however long they may take__despite the pain, despite the circumstances, you do find inner peace and happiness. There are no two ways to live Life. There is just one way __ total acceptance. The moment you bring in denial of whatever is happening, of whatever you are going through, you are not saying yes to Life. You are not saying yes to WHAT IS. Your fog of denial not only blinds your thinking, it devours your happiness. It is only in denial that you will find all the debilitating emotions of fear, anger, guilt, sorrow, suffering, jealousy, anxiety and such. When you accept WHAT IS, when you say yes to Life, there is nothing more required. Examine your Life and expunge all denial from it. Know that saying yes to WHAT IS always leads to instant happiness! Call it nano-second nirvana if you like!